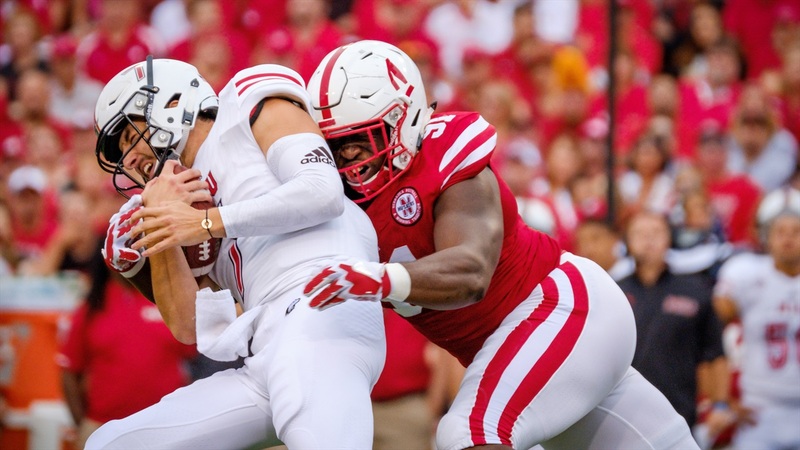 If you want to look for specific areas of improvement within the Nebraska defense, you can start up front with the pressure the Huskers were able to put on Northern Illinois. In the season opener against Arkansas State, the Huskers produced two tackles for loss with one sack. Against Oregon in week two, that number stuck at two, but the sack disappeared. Against the Huskies though, Nebraska was more successful at getting into the backfield, finishing with two sacks and five tackles behind the line of scrimmage. Linebacker Luke Gifford attributed the success to execution after the game, saying it wasn't aggressive play-calling as much as it was guys getting after it. He's partially right. Nebraska was more effective bringing just three and four-man rushes against NIU than it has been at any other point this season, but there were still more numbers coming more frequently too. “Any time I get to hit the quarterback, that makes me happy,” defensive end Carlos Davis said of the success. Davis said the coaching staff has worked with the front seven since the start of the season on “violent hands” and knocking blockers back, and those things finally translated onto the field this week. There’s a different factor, though, that played into the success the front seven had in getting after it in the trenches, and that’s where the real improvement can be seen. After the Oregon loss, defensive coordinator Bob Diaco was asked about pressure – or, in the case of the game, a lack thereof – and he said there’s a balance that has to be found between helping a “developing” secondary and blitzing the quarterback. Early in the season, it was a balance he didn’t want to upset. But, against the Huskies, Diaco felt like his guys were ready to roll. “Three of our most ‘experienced,’ top-performing players aren’t available, so we’re thrust into a situation where next men in are really young, inexperienced players,” he said. “Really nobody had any idea how they were going to behave and respond in game. We know that they try hard, we know they’re wonderful young men, and they’re talented, but they’ve got to get time playing. Basically, from game one to game three, the Huskers’ secondary has grown. Williams said his corners have finally been able to transfer what they’re seeing in film study onto the field. “It’s not like they’re seeing it for the first time,” he said, and they don’t seem shocked when things come at them at game-speed. Williams said the maturation process from day one to now has been rapid because guys just want to be in the Huskers' facilities and get better. Diaco says it’s about “knowing yourself” and he feels like he has a clearer picture now than when the season first began. Diaco has always preached there is nothing like in-game experience and through three weeks of play, the Nebraska secondary has gotten about as much of it as possible. Another thing working in the Huskers’ favor against NIU was the play style. Where Arkansas State and Oregon were spread-it-out, quick-hit on the perimeter, NIU was more deliberate. That figures to be the case as Nebraska gets into its conference slate as well. With that style, Diaco says, there are opportunities for more pressure. If the Huskers’ defense can play like it did against NIU – seven points, just 253 total yards – as opposed to the first two weeks – average of 39 points, 532 yards surrendered – the Blackshirts will be in good shape heading into Big Ten play. Continued growth from the secondary fueling consistent pressure from the front seven makes that a realistic proposition.